The Xbox One allows you to switch seamlessly between four running applications, and have up to six users logged into a single console. Microsoft's Albert Penello sat down with Destructoid recently to talk about the Xbox One's powerful new interface. Just how powerful is it, you may be asking? Well, powerful enough to support seamless transition between four running applications, as well as instantly switch between any six users that are "logged in" to the machine. 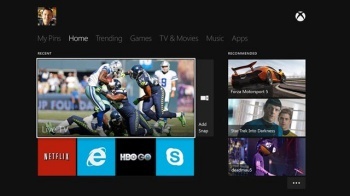 Switching between apps on the Xbox One is "not unlike how it would work on your mobile phone." You simply press the Xbox button on your controller, which takes you to the home screen, where you can seamlessly switch to any apps you have running. The apps you have loaded can also be snapped to one side of the screen, keeping them visible while you play your games. For example, you could have an F.A.Q for a game up in a web browser while you are playing said game. Unfortunately, Penello did say that only one of those four apps can be a game. You can't have two games running at the same time. He did boast that switching games is very easy, and it takes around 10 seconds for the system to close your current game and open up a new one. Penello also talked about how the Xbox One is friendly to multiple users. Six users can sign in to a single console at one time. The Kinect sensors is able to see who is holding the controller and recognizes your voice among others. You could be in a room with five other people logged in and call out to launch a game, and it would do so with your settings and saves intact.